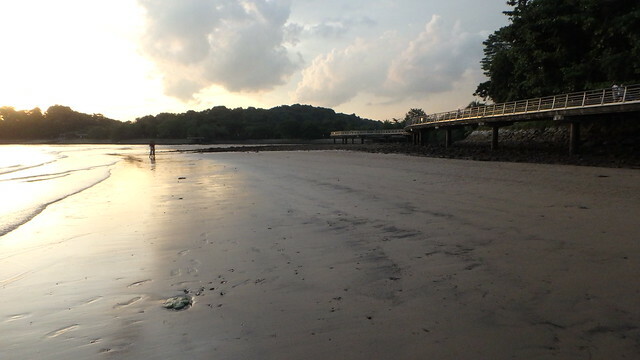 wild shores of singapore: Berlayar Creek AND Labrador surveys! Berlayar Creek AND Labrador surveys! Making full use of the spring low tide! While half the team headed for Labrador, I checked out Berlayar Creek shores with the rest of the team. 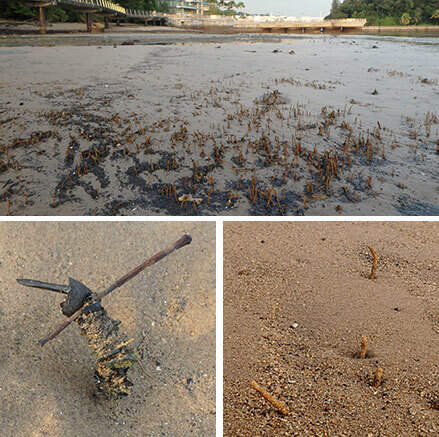 The sandy shores are alive and large seagrass patches have taken root at the mouth of the Creek. We saw for the first time, a Common sea star! And lots of other interesting marine life. At Labrador, the situation is about the same as our last survey in Aug 2017. Recently, there has been more sand accumulating at the mouth of the Creek and even among the mangroves upstream along the Creek. 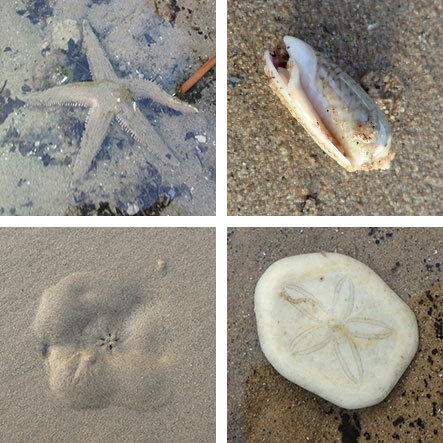 It was heartening to see that animals are living the sand. suggesting that it's not toxic. Other good signs of life are several different kinds of tube worms: Gregarious tubeworms, Solitary tubeworm and Straw tubeworms. The patch of sand east of the Creek mouth has grown and displaced the seagrass patch further east. It was nice to see a Common sea star (our first sighting for this shore). There were also several Weasel olive snails burrowing in the sand, and some living Cake sand dollars. There was a skeleton of a Thick-edged sand dollar, which is not commonly seen. At the mouth of the Creek, large patches of lush Spoon seagrass form a dense carpet. The white spots are Small coin green seaweed which have lost their colour. This seaweed is abundant at both Berlayar Creek and Labrador today. Among the seagrasses, we saw hermit crabs and a few Fan shell clams. 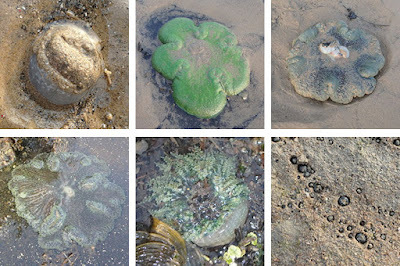 Among the interesting finds on the sand were a Very long sea anemone (our first sighting for this shore). 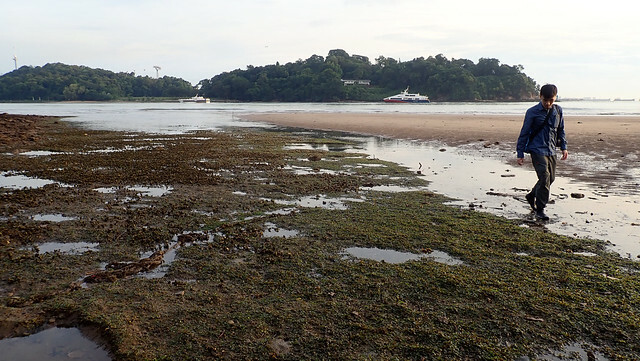 There were also still lots of Haddon's carpet anemones on the sand bar where the seagrass used to be. 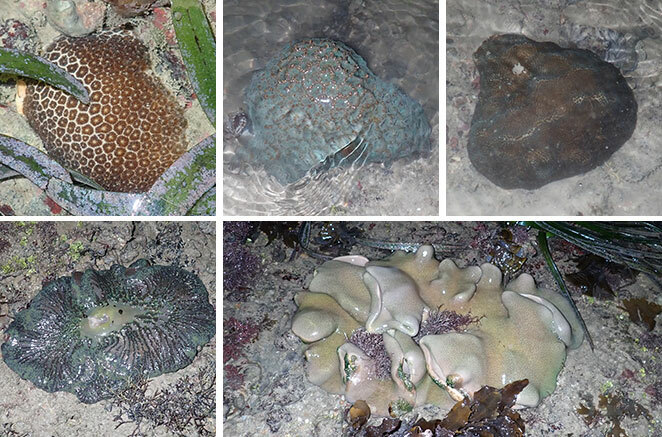 I also saw a Giant carpet anemone, a Frilly sea anemone and many Banded bead anemones. 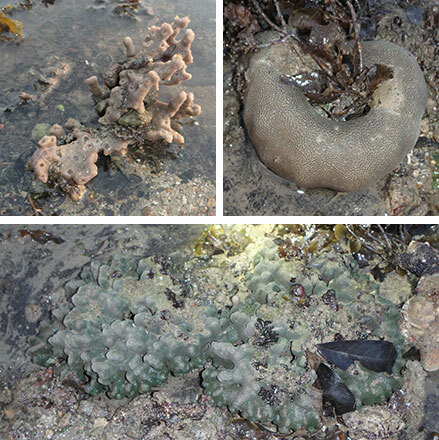 Nearer the seawall, there were a few small corals and some sponges. Sadly, there were still a lot of golf balls. We didn't pick them up today as we rushed over to Labrador to catch the tide. After our last survey in Oct 2017, Ronald Batchelor, Senior Horticulture Officer at Keppel Club recently shared with me that the Club had taken measures to stop the golf balls from entering into the Berlayer Creek mangroves and shores. The gratings had been already installed at a big drain outlet to prevent the golf balls from going into the mangroves from the driving range. More drain traps were placed to prevent more balls from being discharged into the Berlayer Creek. 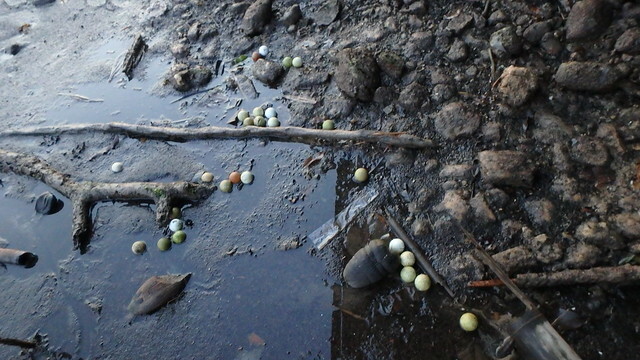 He also shared these photos Club workers have also been cleaning up golf balls from the Creek. So bravo to the Club! The Berlayar team also managed to have a quick look at Labrador. The seagrasses near the jetty are still lush, with long Tape seagrasses, healthy looking Sickle seagrass and Spoon seagrass. 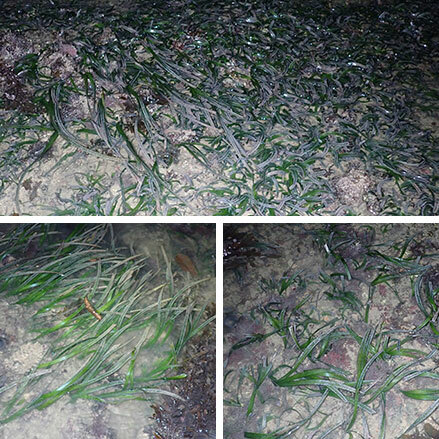 Although I did see a small clump of Tape seagrass with short leaf blades. 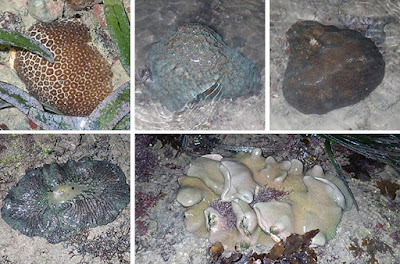 In the short stretch of shore, I saw a few small hard corals, one small leathery soft coral and a Giant carpet anemone. They were all not bleaching. The rest of the team documented many other interesting creatures: There were also lots of halfbeaks and small octopuses! And many Coral ghost shrimps. And this pretty Feathery file fish! The team that surveyed Labrador today say the situation is about the same as our last survey in the morning of Aug 2017. Labrador shore is now permanently closed to the public due to safety issues. Labrador is Singapore's last natural cliff on the mainland. There is work ongoing now to stabilise the cliff. 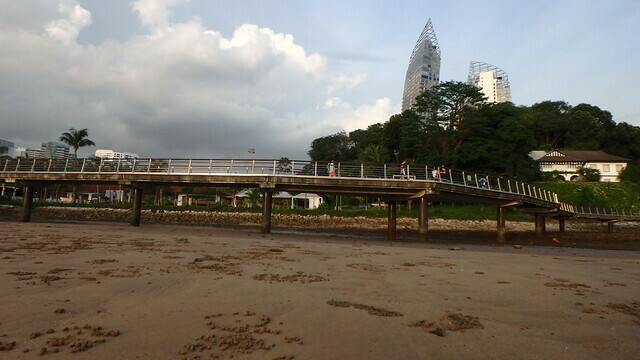 But the jetty is now open, with fishing only allowed at the furthest end of the jetty. More about what you can see and do at Labrador on the NParks website. 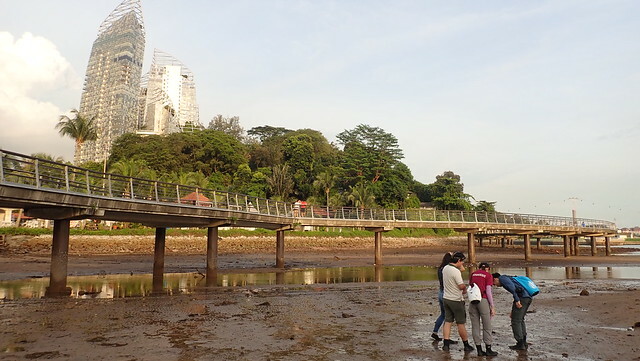 Thanks to NParks for permission to survey the shore. 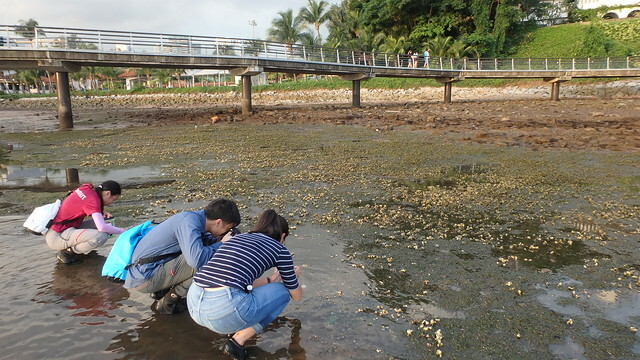 Special thanks to Yi Fei (seen here removing trap from the shore) and Pin Chong for looking after us and for taking care of these precious shores. Others on this trip: Abigail.